Many artists and galleries offer paint parties and "sip and paint" or "corks and canvas" events. While those are fun and creative, they are more social than instructional. Brent is looking to fill that gap for those who are wanting to really learn and experience painting. 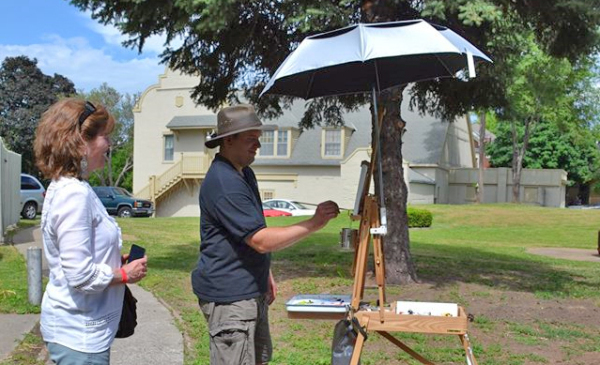 Brent is offering outdoor painting tutorials in St. Joseph, MO for those interested in taking up painting as a hobby. These are 1-day (2-3 hour) tutorials on plein air painting with pastels---for beginners. All supplies will be provided. That covers lesson and supply fees...the box of 30 pastels you will be using is over $50. The surface you will be painting on is $12. This rate is cheaper than if you supplied your own materials which would cost you over $200 brand new. Plein air, meaning "open air," is currently in a new renaissance. People all over are enjoying the benifits that come with it, whether recreational, hobby, or professional. Like everything else, painting is a learned skill. Sign up TODAY!